The Moreau family has lived in the heart of Chablis since 1814. At that time Jean-Joseph Moreau founded the wine-merchant trading firm. In 1974 Hiram Walker acquired 50% of the company and acquired the remaining shares in 1985. J. Moreau et Fils was then sold with no member of the family remaining in the company to Boisset in Nuits St Georges. The Moreau family retained ownership of their vineyard holdings throughout these transitions. 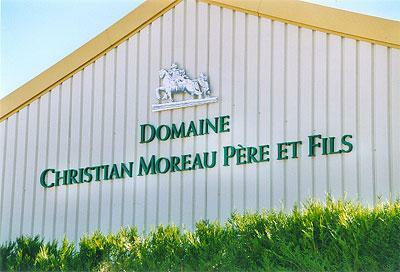 With the 2002 vintage, Christian Moreau Père & Fils regained their right to produce wines sourced from their extensive vineyard holdings and market the wines under their own name. Today, Fabien Moreau, the sixth generation of the family, is the super-star winemaker of this beautiful Domaine in Chablis. After graduating in Oenology in Dijon and earning a MBA at E.N.I.T.A in Bordeaux, Fabien also studied in New Zealand. The Chablis "AC" is their only wine that is not produced from 100% of Domaine-grown fruit. The Domaine holds a total of about 12.5 hectares with vines averaging 45 years old. The Domaine is committed to the expression of every nuance of its vineyards, terroir by terroir. From Stephen Tanzer (Vinous Media): "Fabien Moreau has taken these wines to ever-higher levels of precision in recent years by fine-tuning harvest dates, oak regimes and bottling times. The Moreaus started harvesting on September 15 in 2014, then decided that the early fruit was too high in acidity and not sufficiently ripe. They stopped for several days and then restarted on the 22nd following rain the previous day. This is an excellent vintage here, with the wines combining richness and firm structures for graceful development in bottle. The Moreaus also outperformed in 2013; although they started harvesting earlier than most of their neighbors (September 30), strict sorting of rotten grapes was essential. And as the botrytis was wet rather than dry, they benefited from harvesting by hand. This estate was certified as organic by Ecocert as of the 2013 vintage."